Polar Bears are very curious about any unusual events, but this baby, who is only 11 months old, finds the tundra buggy and the faces on board very intriguing. As the tundra buggy stops in the Churchill Wildlife Management Area in Manitoba to let tourists capture some pictures of the baby polar bear, the Polar Bear decides to explore as he has never seen anything like this before. The mother of this baby is not very far off, but she needs to let her cub investigate as once the cub is two or three years old, surviving the Arctic is a solo event. Until such time, the mother Polar Bear keeps a close eye on her cub to ensure that it stays out of trouble. Polar Bear, Ursus maritimus, 11 months old seen from a tundra buggy in the Churchill Wildlife Management Area, Hudson Bay, Churchill, Manitoba, Canada. 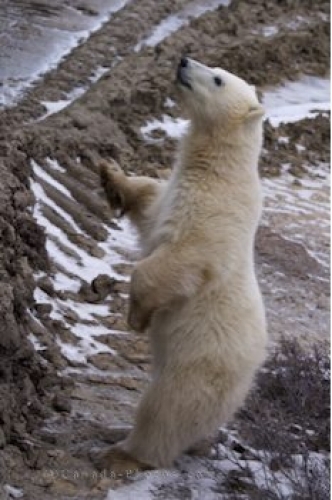 Picture of a curious baby Polar Bear looking up towards a tundra buggy in Churchill, Manitoba.